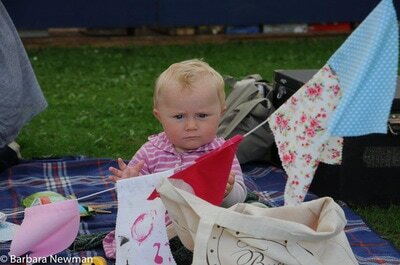 One of our youngest volunteers helping decorate the marquee! It takes over 200 back room people to make the Festival happen! They are all volunteers who enjoy the buzz of working together to make the biennial Arts Festival in Goring and Streatley a success. If you’d like to help get in touch now and tell us what you would like to do. Whatever your skill or interest, we can find you a role. You could manage an event, look after a celebrity, help with fundraising, design posters and leaflets, use your social media skills in the marketing department, shift furniture, put up banners, deliver flyers, sell tickets, operate sound and lighting, serve in the catering and bar areas or help in a myriad of other ways. So, whether you are interested in getting experience to enhance your CV or would like to indulge your interest in the arts, we can use you. ​The Festival happens 14-17 June with fringe events from 9 June, but the preparation starts now! And if you are not already a Friend of the Festival do consider becoming one.